Oregon Gov. Kate Brown, U.S. Sen. Jeff Merkley and TriMet General Manager Neil McFarlane complete the first ride on the future MAX Orange Line. Oregon Governor Kate Brown, U.S. 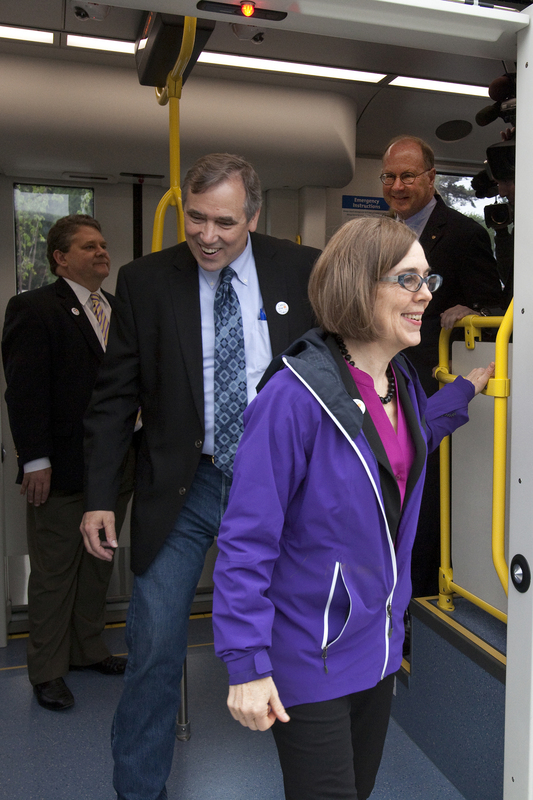 Senator Jeff Merkley and other elected officials and project partners today took the First Ride on the Portland-Milwaukie Light Rail Transit Project – the future MAX Orange Line. It was the first time MAX trains operated at regular speeds with passengers along the entire 7.3-mile route between downtown Portland and north Clackamas County. About 500 people participated in the event that marked a major milestone for the project, which opens in 119 days. “Investments in transit are essential if we are going to preserve the mobility of goods and people who live and work in this region,” said Governor Brown. Oregon Gov. Kate Brown, U.S. Sen. Jeff Merkley and TriMet General Manager Neil McFarlane lead dignitaries off the first train to arrive at the SE Park Ave MAX Station. The guests boarded new Type 5 MAX trains at the Lincoln St/SW 3rd Ave Station in Downtown Portland and traveled across Tilikum Crossing, Bridge of the People, through SE Portland to the end of the line at the SE Park Ave Station. TriMet is buying 18 Type 5 trains from Siemens based in Sacramento. The First Ride event was sponsored by Siemens. Over the next few months TriMet has planned numerous events leading up to the Grand Opening. Visit CatchtheOrange.com for a complete list of events leading up to the Sept. 12 Grand Opening. Ten stations in 1 minute. See the time-lapse video of the MAX Orange Line from downtown Portland at Lincoln St/SW 3rd Ave Station, across Tilikum Crossing, Bridge of the People through SE Portland to downtown Milwaukie and north Clackamas County.